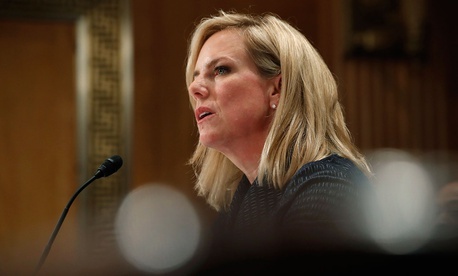 The White House is discussing possible replacements for Department of Homeland Security secretary Kirstjen Nielsen, because Donald Trump is unhappy with how she is running the massive agency tasked with keeping the U.S. safe, according to two people briefed on the situation. Names being discussed inside the White House include Tom Cotton, the senator from Arkansas, Energy secretary Rick Perry, and Thomas Homan, the retiring head of Immigration and Customs Enforcement, one of these people said. Cotton and Perry were also considered for the position previously. Spokesmen for the three men and DHS had no comment. Nielsen, 46, is a former lawyer and George W. Bush homeland security appointee who has been in the job since just December 2017, and her departure would add to the Trump administration’s unusually high turnover. Her nomination last October was questioned in DC’s security community, because some felt she didn’t have the experience for the job. She had the support of former boss and White House chief of staff John Kelly, however, as well as DC lobbyists. In several negotiations since Trump was elected, Congress refused to give DHS the billions the agency requested to build his promised wall on the US’s southern border. Nielsen is being blamed in the White House for the omission, one of the people briefed said. Far-right pundits have been mocking the administration this week for failing to get it done, angering Trump, this person said. Trump was also furious when he found out that the omnibus spending bill that funded the federal government this March barely contained any funding for the wall. Under Nielsen, the DHS has pushed many of the Trump administration’s hardline immigration priorities, which have been referred to as a “mild form of ethnic cleansing.” The agency ended “Temporary Permanent Status” for hundreds of thousands of US residents, many with children who are American citizens. It has relied on misleading statistics to raise concerns about immigrant crime and Trump officials say it plans to separate immigrant children from their parents even if the families are seeking asylum. In January, Nielsen barred all but a few close DHS allies from speaking to Congress on immigration, angering some top officials there. Critics say the DHS’s anti-immigration focus has come at the expense of the nation’s security, and of fighting home-grown extremism and threats to US cybersecurity.